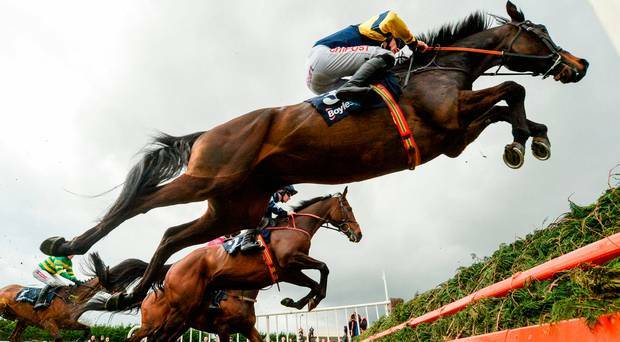 Staged at Fairyhouse racecourse the 2018 Irish Grand National is run over a trip of 3m5f with 24 fences to be jumped. The gruelling contest is always staged on Easter Monday (2nd April 2018), while several Irish Grand National winners have also won the Aintree Grand National, but none in the same season – Bobbyjo and Numbersixvalverde are recent examples of this. For example, did you know? The 14 of the last 15 winners carried 10-13 or less in weight, while 13 of the last 15 successful horses were Irish-bred. We’ve also seen just twos winning favourites in the last 15 renewals, including 12 months ago when the classy Our Duke landed the spoils as the market leader. VERDICT: Our Duke lumped 11-4 to victory 12 months ago but really, based on recent runnings, the Irish Grand National has gone to horses carrying 10-13 or less in weight. These horses have paid out for punters in 14 of the last 15 runners so if we apply this trend to the 30 runner field we can knockout the top two on the card – the classy pair of Outlander and Bellshill. In fact, if we want to take the weight trend a bit further then 12 of the last 15 winners carried 10-8 or less so this will get rid of another four – Monbeg Notorious, Dounikos, Lord Scoundrel and Snow Falcon. Of the 30 runners a massive 30% are owned by Gigginstown as they look to add to their 2015 and 2016 wins in the race. Back to the trends and with 14 of the last 15 winners having raced in the last 8 weeks then of the 24 left this knocks out only The Paparrazi Kid, who was last seen 351 days ago. Irish-bred horses have been responsible for 13 of the last 15 winners, while 12 of the last 15 came from outside the top three in the betting, returned a double-figure price and were also aged 9 or younger. With trainers Willie Mullins and Gordon Elliott responsible for 17 of the 30 runners then it’s also likely we’ll see one of these powerhouse yard land the prize. However, it’s worth pointing out that both are yet to land this big Irish race. The last horse aged older than 10 years-old was Mudahim (11) in 1997, so based on that it’s probably best to focus on horses aged 10 or younger, while with only three 10 years-olds winning since 1996 then really it’s horses aged 9 or younger that have held sway in recent years. At the other end of the age spectrum – we did see a 6 year-old land the prize in 2011, but since 1986 that’s been the only one. Three of the last 4 winners have, in fact, been aged 7 years-old. Several horses still fit the bill with the main trends but the three that stand out for me are – MALL DINI, OSCAR KNIGHT and SQUOUATEUR. Mall Dini looked all over the winner of the Kin Muir at the Cheltenham Festival last time out and one although he’s a horse that probably doesn’t win enough, he’s one that rarely runs a bad race. He’s finished in the top 5 in all of his last 16 races and with just 10-4 here then will feel like he’s got a featherweight on his back after running with 11-10 last time and 11-12 in 6 of this last 10. Oscar Knight hails from the Thomas Mullins camp and like Mall Dini gets in here with a very light weight (10-0). Yes, he’s actually racing 3lbs out of the handicap but over this long trip I’m not too worried about that. He was only 3 lengths behind Total Recall last time over hurdles and having not run since then connections have clearly been trying to protect his handicap chase mark. He also unseated in the race 12 months ago but his hand had yet to been played and still looked to have a chance when coming down at the 18th. Okay, stamina is a slight concern but he’ll be ridden with that in mind and ran on well last time over 3m to take second to suggest it’s worth another crack. The Gordon Elliott-trained Squouateur is also running from out of the handicap (4lbs), but this 7 year-old also ran a blinder in the Kim Muir to be a close third. He’s a proven course winner here so we know the track suits while with that last run being his first since wind surgery then we can expect to have brought him on again. Yes, he’s another that will need to prove his stamina but with just 10-0 he’ll have every assistance from the saddle on that score to get home. Of the rest, proven course and distance winners Thunder and Roses (won this in 2015), Forever Gold and Bless The Wings are respected based on the fact we know then stay and like the trip, while the only other past distance winner in the field are Folsom Blue, who will be looking to give jockey Robbie Power back-to-back wins in the race – however, at 11 years-old he will also be looking to become the first horse that old to win since 1997.